The Yoga Cats and Yoga Dogs were inspired by pictures in the Yoga Cats/Dogs calendars (photography by Dan Borris). Each piece comes with an explanation of the benefits of the pose, along with step-by-step instructions. We also have a series of larger yoga mosaics with and without mirrors. They are mounted in a 12″ x 12″ wooden frame which is either stained or painted to complement the design. The remaining pieces for sale are priced at $144.00. 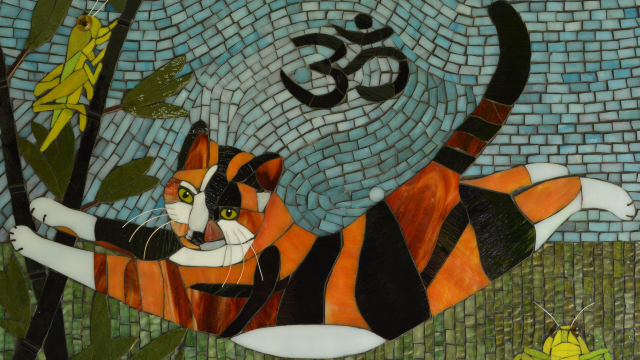 All of the yoga mosaics currently for sale can be seen in person at the Crazy Lady Gallery in downtown Port Orchard. The ‘Autumn Orchid 2’ mosaic mirror captures one of our favorite orchids, measures 10″ by 10″ and is priced at $135. 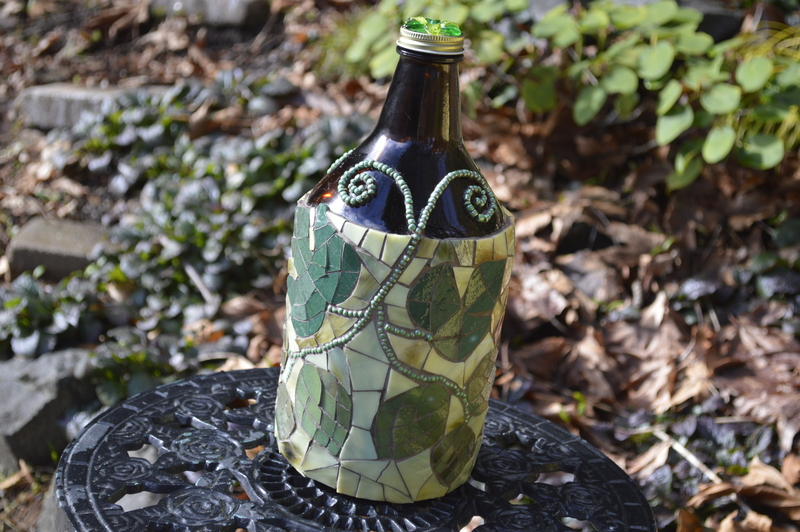 This fun growler is covered with stained glass and beads and is priced at $75. ‘Bug Bench’ adorns our front porch right now and we love its vibrant colors. The bench is curved and measures 30″ x 13″ at its widest point, with a height of 13″. Both the concrete bench and legs are stained brown. Shipping costs on this item would be prohibitive, so we are offering the bench for sale locally (Port Orchard, Washington area) at a price of $450. We also gladly accept commissioned work. Original mosaics range from $1 to $1.50 per square inch, depending on the complexity of the design. Here is an example of a recent commissioned work (12″ x 20″) that sold for $300. Call or email so we can begin to discuss your ideas and your price range. The works for sale and any commissioned work can be paid for by check or by PayPal. Please contact Louise if you have any questions or comments, or to place an order.